Let the True 5200 Bottom assembly begin! It has been a long winter, but, finally, all of the structural work is behind us. Today begins the final steps in giving this 1946 Chris-Craft Brightside U22 a True 5200 Bottom. We begin at the transom and work forward, which allows us to make huge strides right away. 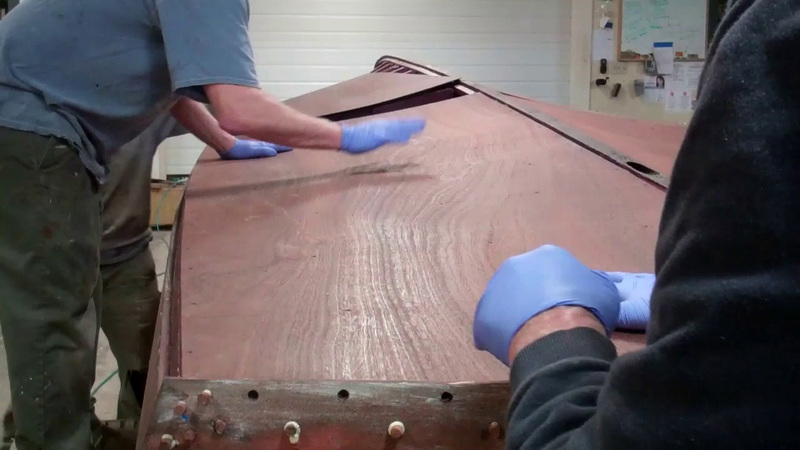 Once we’ve installed the first two sheets of Aquatek Marine plywood, we are at least 80 percent of the way to the bow. We have learned not to apply a ribbon of 5200 to the chine frame face. Rather, there is always surplus material available as we smooth the 5200 along the frames. The chine frames offer a perfect depository for this surplus, which also greatly reduces waste. (The other reason involves the risk of T-shirt bottoms draping and dragging in 5200, which will NOT come out in the wash.) Once all of the surfaces have been frosted, we carefully lay the sheet in place, being sure to pound it flat. You will notice that the fasteners sunk into the frames are one 8” to 12” centers. Our goal here is securing the sheet until the 5200 cures. We will be sinking screws through the external planks on about 2” centers when they are installed. Then, since the 333 tends to retard curing, we make a final pass along all of the beads of 5200 with a rag soaked in Acetone. The Acetone both removes the 333 residue and contributes to accelerated curing. Next PostNext 1960 Cruisers Inc Seafarer Milestone: She’s Ready For Paint!